We really wanted to push the boundaries and do something special for our very first feature car here on Speed Nation. So we found a rad car, turned the heat up and worked with some of the industries finest. 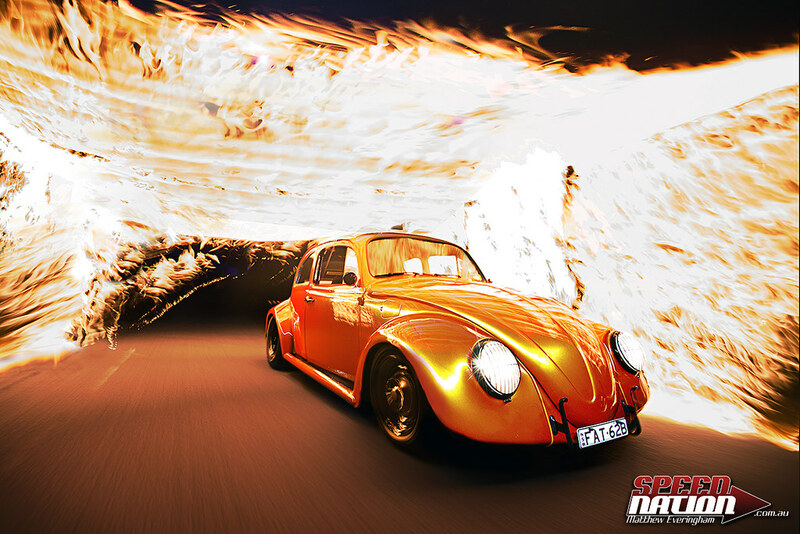 This piece is a collaboration between Speed Nation and Canibeat. Thanks to CIB boys for the write up, for sharing our passion and helping to showcase our unique rides to our friends on the other side of the planet. Now, let’s get into it! The 1960’s and 70’s brought us the muscle car era which led to a whole new way to describe the automobile. Words like “mean” and “tough” began to roll off the tongue when describing these menaces to society. 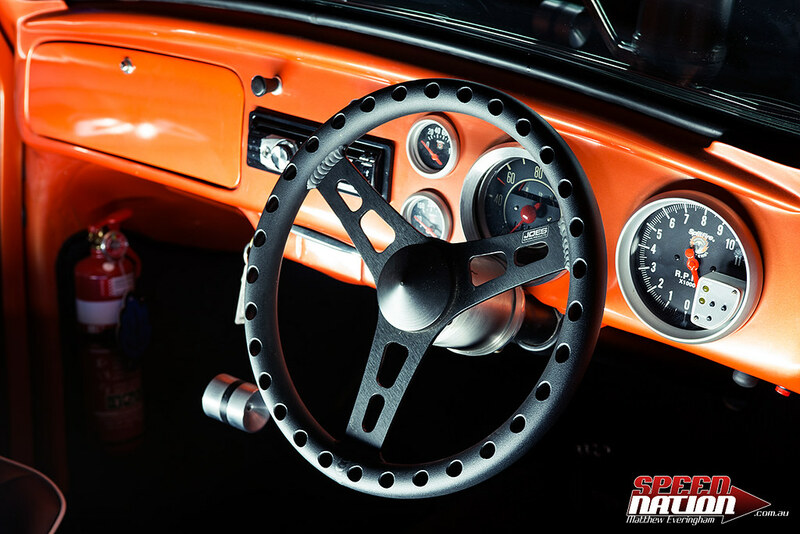 That “tough” look still lives on today and has even reached outside of the muscle car genre to give influence to top-notch builds like Dallas Webb’s stunning Volkswagen Beetle. 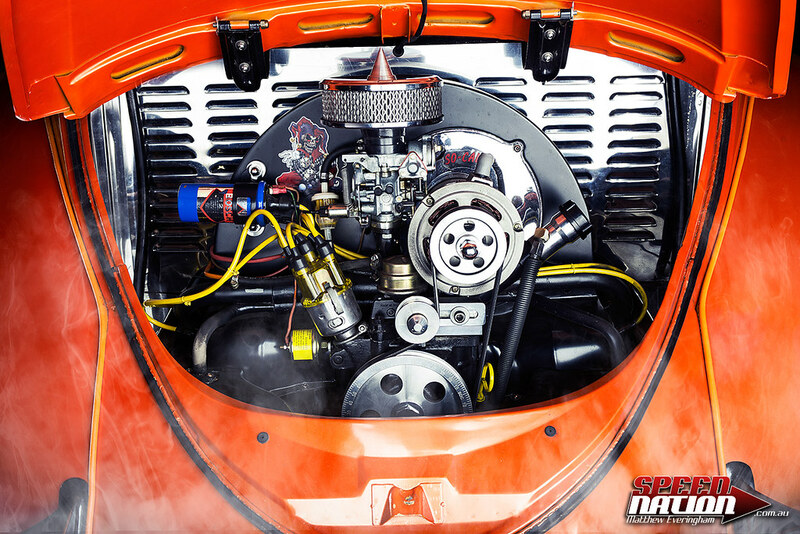 As a kid, Dallas grew up around his dad’s hot-rods and muscles cars but when he came across the Beetle he fell in love with its simple lines and saw real potential in the chassis. 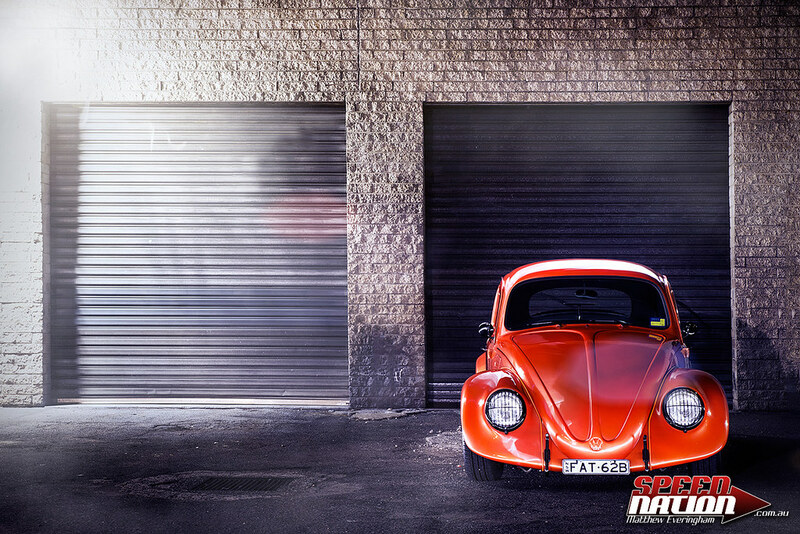 From those years on, he vowed that if a Beetle ever happened to fall into his hands that he would take full advantage of his upbringing to create one tough Volkswagen. Dallas would uphold his promise, as one day after telling his dad the big plans that were bouncing around in his brain, his dad mentioned a family friend had one that he might let go. As the doors were opened to the shed where this Beetle had laid resting for years, Dallas’ eyes were met by a Bug that was in need of some love. Dents and rust covered the outside shell and the interior didn’t fair much better but after some haggling, Dallas was the proud owner of his first Beetle. Since being pulled out of its dusty place of residence, this Beetle has made a complete transformation. The body was taken down to bare metal with the rust being cut out and replaced by fresh steel. Dallas also replaced numerous panels due to some being filled with dents. All of this work left the Beetle looking more like a villain in a horror movie rather than a show quality car but this was just the groundwork of a beautiful outcome. This would be just the beginning for the body-work though. 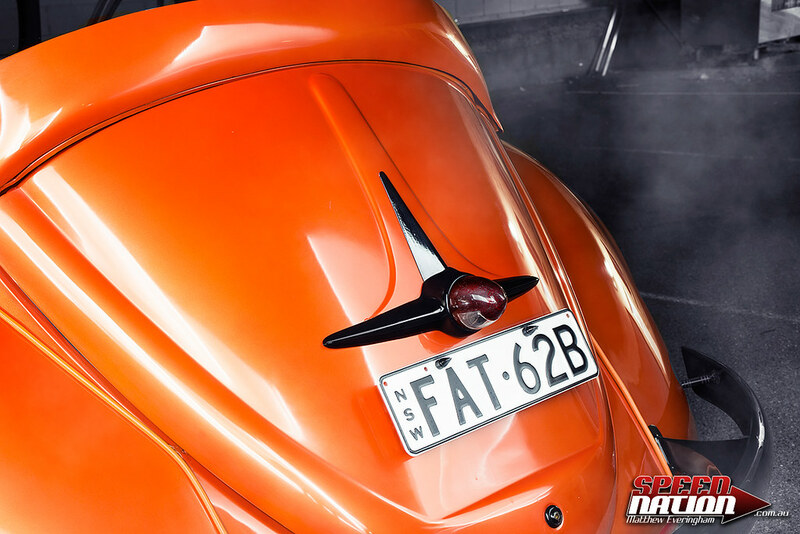 The body seam along the front doors were removed to give this Beetle even smoother lines. For functionality, Dallas welded in a fuel filler door from a later model so the hood didn’t have to be opened every time he wanted to fuel up. To get ready for his wheel and tyre set up, he widened the fenders and also the bumpers to look proportionate to the fenders. Next up was making this body as smooth as possible. This meant removing the indicators all around, filling in the horn grills and also ditching the rear lights for one made from an old FJ Holden. The next project that was tackled was building home-made running boards from solid steel so that could actually be functional. 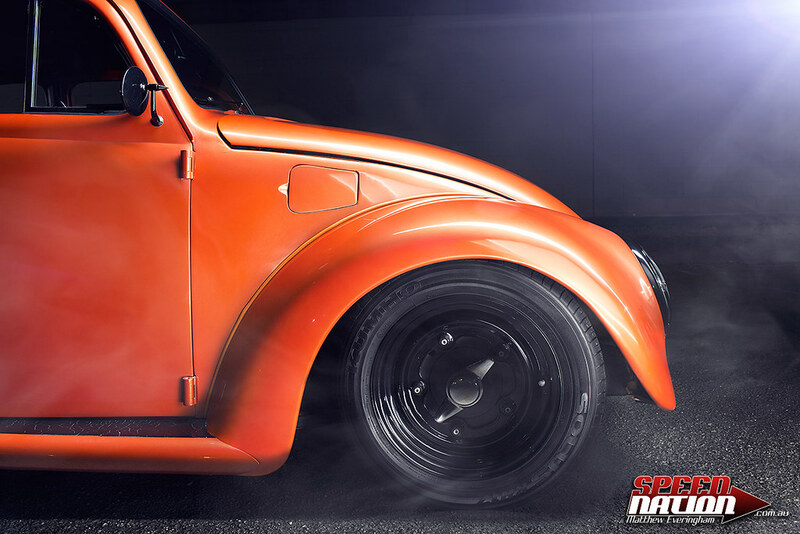 After the dust settled, Dallas was left with a sleek Beetle that was sure to turn heads. After being coated with a mix of orange and yellow pearl with gold flake, Dallas turned his attention to the interior. The inside was covered in Dynamat to help with road noise and then was covered by new carpet. 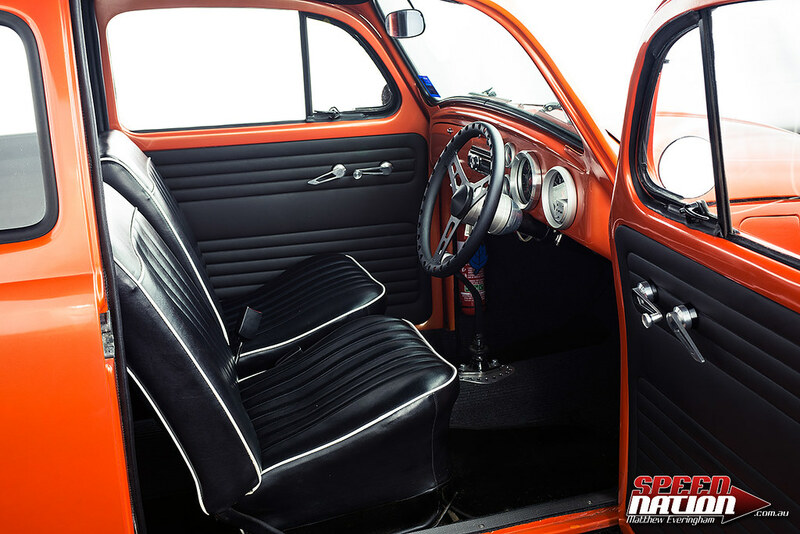 After the new flooring, he added a set of new seats along with new panels and trim to bring the interior back to show-room condition. 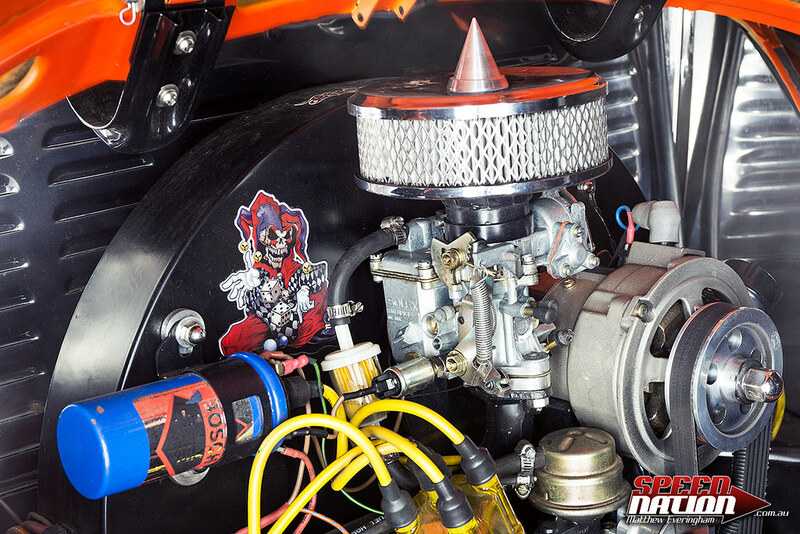 He also added some additional touches like a steering wheel out of a sprint car, aftermarket gauges, modern self-retracting seat belts and even cup-holders as this is no garage queen, it was built to be driven. 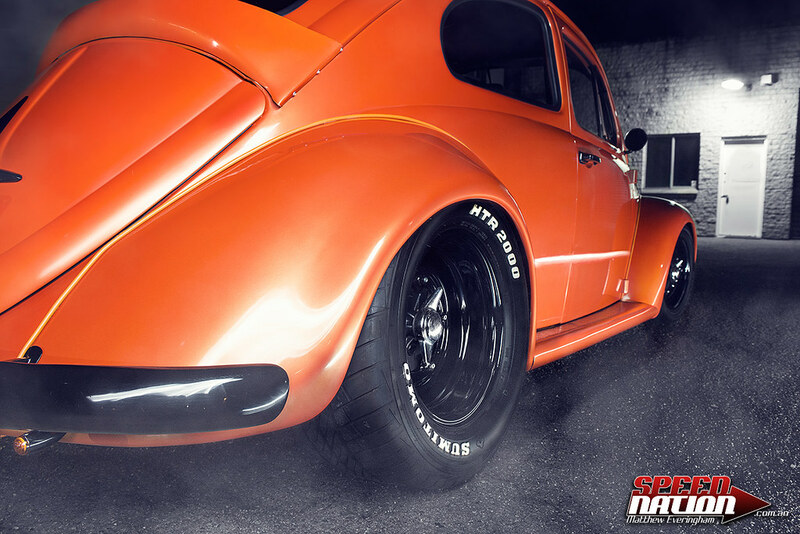 The first thing I noticed when first going over the photo-set by Matthew Everingham, was the tough stance of the Beetle. This was achieved by-way of a 2” narrowed front beam and 2” drop spindles up front. 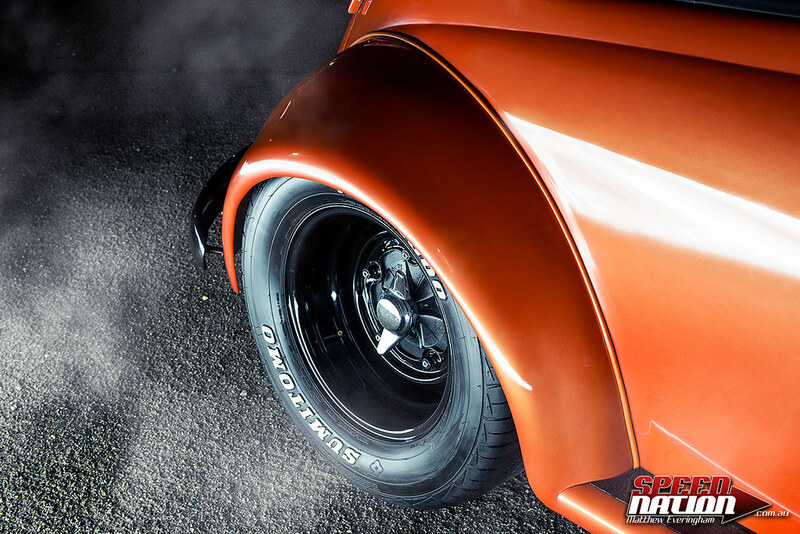 Wheels are custom-made steelies with 15×8 in the rear and 14×6 in the front giving it that muscle car rake. 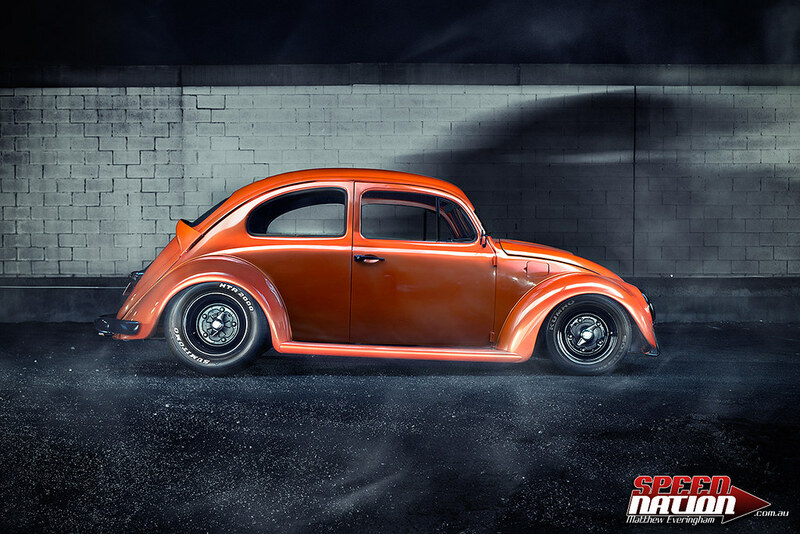 The Volkswagen Beetle over the years has become one of the favorite canvases for car enthusiasts no matter the age or automotive taste of its owner. 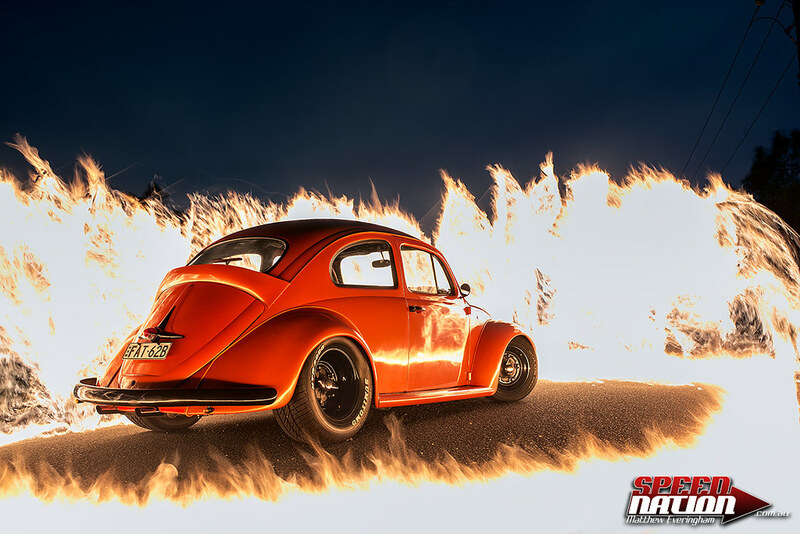 It’s always a pleasure to see what new ideas or “twists” come out into the world with the Beetle and this version by Dallas is one that will be a hit no matter your taste.